The Young Farmers’ Clubs of Ulster (YFCU) today announced that Massey Ferguson, one of the world’s leading tractor brands, will continue to be the overall sponsor of its annual general meeting (AGM). 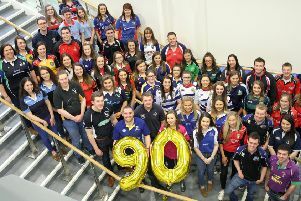 The highly anticipated annual event, which will take place on Saturday 22nd April at Armagh City Hotel will be attended by over 300 young farmers from across Northern Ireland. Massey Ferguson was founded in 1847 originally manufacturing simple farm implements. Along the journey the company has hit land marks such as patenting the 3 point hitch, used on virtually every tractor today, 1938 saw the invention of the first self-propelled combine, and in 1946 the company opened a plant in Coventry, England, which became the world’s largest factory solely devoted to the production of tractors. More recently Massey Ferguson has sponsored the YFCU Agri Conference and last month the Irish Agri Careers Expo.